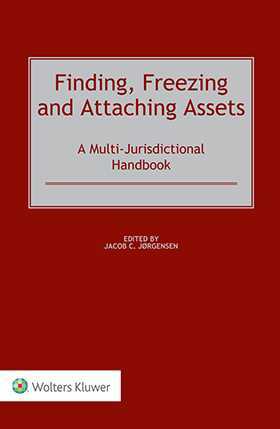 Finding, Freezing and Attaching Assets: A Multi-Jurisdictional Handbook is about how to find out whether a defendant has any assets before initiating costly litigation, arbitration, or insolvency proceedings, and how to freeze such assets with the aim of eventually enforcing a judgment or award. The globalization in trade relations has resulted in a steady increase in cross-border disputes and, due to the ease with which assets can be moved around the world with the help of online banking and fiduciary service providers, parties are increasingly finding themselves suing or being sued outside their home jurisdictions. As a result, there is increased interest among clients with regard to the finding and freezing of assets as the parties involved in commercial disputes these days are doing their best to expatriate assets as well as undermine enforcement. The purpose of this book is to provide the reader with as much information as possible on asset identification on a jurisdiction-by-jurisdiction basis and also on the client’s decision of whether or not to freeze assets once the assets have been identified. invoking remedies available to a party facing asset shielding manoeuvres. Nineteen country chapters, written by lawyers with decades of hands-on experience in helping their clients find, freeze, and attach defendants’ assets provide practical guidance to legal professionals representing parties in cross-border commercial lawsuits, international arbitration proceedings, simple debt collection matters, enforcement proceedings, divorce proceedings, inheritance matters, and other legal matters where the assets in dispute are thought to be located abroad. Each contribution offers an overview of pre-trial asset tracing techniques and rules regulating freezing orders and enforcement methods in the jurisdiction covered – describing not just what the law says but how the law actually works. The jurisdictions covered include several offshore havens that are frequently used to hide assets in. This book provides the reader with an overview of the research environment and the sources of information available in different jurisdictions to thereby assist lawyers in finding out whether the other party has assets to pursue. There has been a need for some time for a book of this kind, due to the trend in international litigation and arbitration, and the tendency of parties to hide and remove assets. The book appeals equally to both litigation and arbitration proceedings and is an indispensable tool for international litigators, arbitration lawyers, and lawyers involved in cross-border insolvency and debt recovery proceedings, as well as for academics and scholars involved in legal research projects or law reform programs.